Russia will test launch around 10 Angara heavy carrier rockets in the next few years, the general designer of the rocket’s manufacturer, Khrunichev Center, Alexander Medvedev, told TASS on Tuesday. "We plan to complete test launches of the carrier rocket from the Plesetsk cosmodrome by 2020 and to start the serial Angara production after that," Medvedev said. "The first Angara launch from the Vostochny spaceport is set for 2021. In general, around 10 test-launches of Angara heavy rockets and four test launches of [Angara] light rockets are planned," Medvedev said. 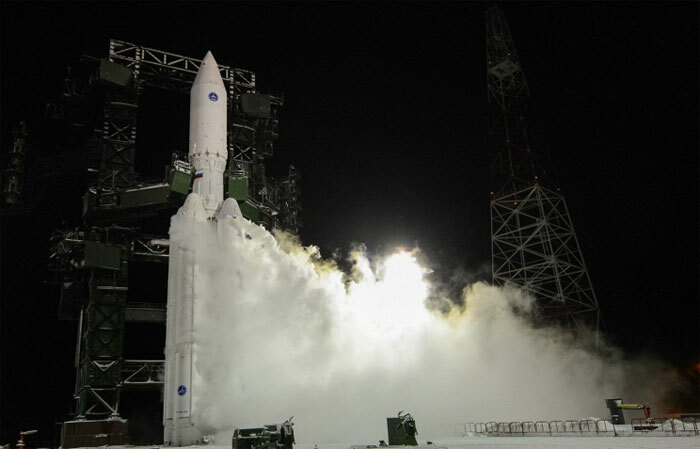 He stressed that Angara rockets will carry spacecraft during test-launches. The first test launches of Angara heavy and light rockets were held in 2014 with simulated payloads. Angara, named after a river in Eastern Siberia, is a family of space-launch vehicles being developed by the Moscow-based Khrunichev Research and Production Space Center. Angara 1.2 has a lift-off mass of 171 tons and can deliver over 3 tons of payload to a low orbit. Angara 5 is a heavy lift launch vehicle, weighing 773 tons at lift-off. Angara 5 has a payload capacity of 24.5 tons. The development of the Angara-5 heavy lift launch vehicle for manned missions will cost at least 10 billion rubles ($166 million), the general designer of the rocket’s manufacturer, Khrunichev Center Alexander Medvedev, told TASS on Tuesday. "Angara-5 is set to carry the first manned spacecraft in 2021," Medvedev said. "The first rockets will be launched with no people onboard as it is necessary check the launch vehicle’s reliability in real conditions." He added that the launch vehicle’s development for manned missions will cost "some 10 billion rubles." Russia is in talks with Brazil on creating a launch pad for Angara space rockets at the Alcantara space site, Alexander Medvedev has told TASS in an interview. "There have been ideas and proposals for building a separate launch complex for Angara at the Alcantara centre in Brazil. Making launches from the equator are a promising idea. A very competitive option. Talks are in progress," the source said. Earlier there were reports of plans for relocating to Brazil the Sea Launch project, which over several years was used to put in space Russian-Ukrainian Zenit rockets from a floating launch pad. Sea Launch suspended launches in 2014. Brazil is pushing ahead with its own space program but has not managed to launch a single space rocket of its own manufacture to date. Several launch attempts at the Alcantara space centre ended in failure. The second test launch of the Angara heavy carrier rocket is scheduled for the end of 2016. It is to put into orbit the AngoSat satellite, Medvedev said. "The launch of the heavy-class Angara carrier rocket is scheduled for the end of 2016 from Plesetsk Cosmodrome. The pay load is already known — it’s the AngoSat satellite, there is such a space module within the framework of international cooperation," he said. The agreement on the satellite communications project involving Angola was signed in the summer of 2009. It was reported at that time that the geostationary satellite for the AngoSat system will be built by the Energia Rocket and Space Corporation. Russia’s Khrunichev State Research and Production Space Center plans in the future to make reusable stages for them, General Designer Alexander Medvedev told TASS in an interview. "We have serious intentions in the future to make the universal modules reusable, recoverable. This will make it possible to cut the specific payload launch cost by one-third or even two times," he said. Asked about the timeframe of the project implementation, Medvedev said: "I am an optimist, so I would like it to happen in 2025 — with all the necessary works." In particular, the Khrunichev Centre’s representative said, it is also necessary to confirm viability of the stage recovery scheme. The idea of reusable stages is currently implemented by the Space-X company in its Falcon rockets. However, the American specialists have thus far failed to successfully "catch" the return stage.